Boo! Yes, very scary. For some reason dry aging beef has become this big scary ordeal, usually left to professionals and the insane. I am not a professional. But it is really so simple it is almost stupid. Oh. Please don’t sue me if it all goes horribly awry, I don’t really know what I’m talking about. 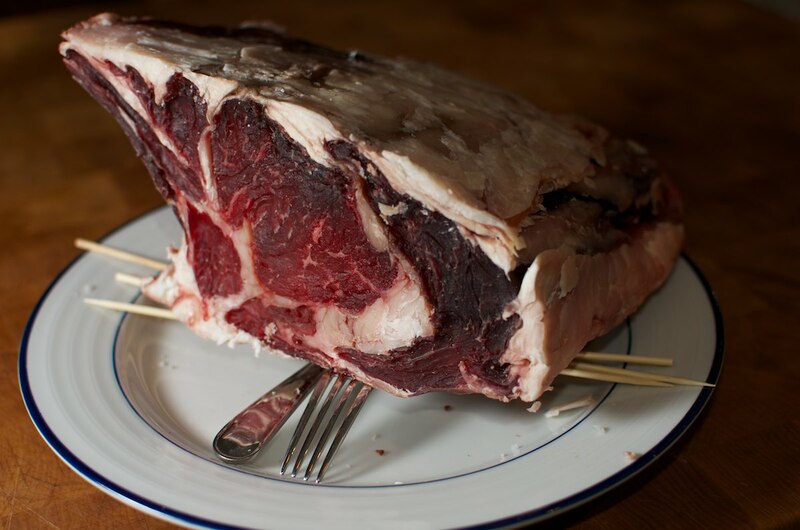 Once you have dry aged steaks in hand, read my posts about how to cook a great steak over a fire, or indoors. 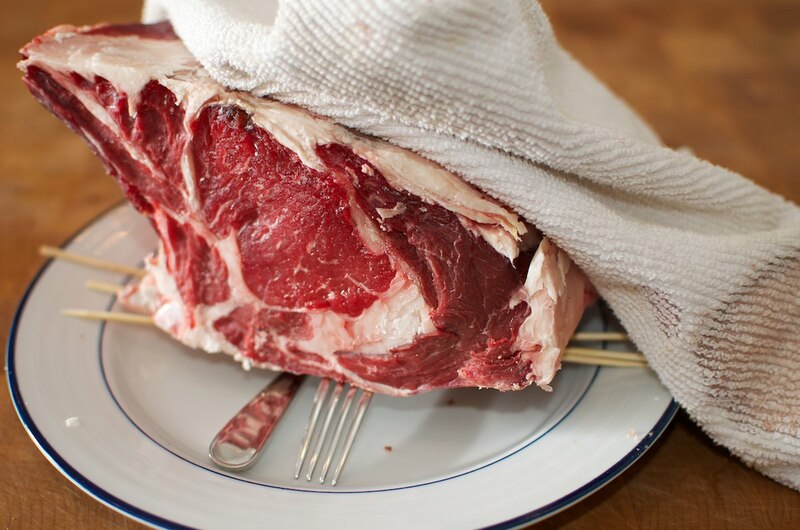 Aging beef tenderizes it, whether wet or dry aged. 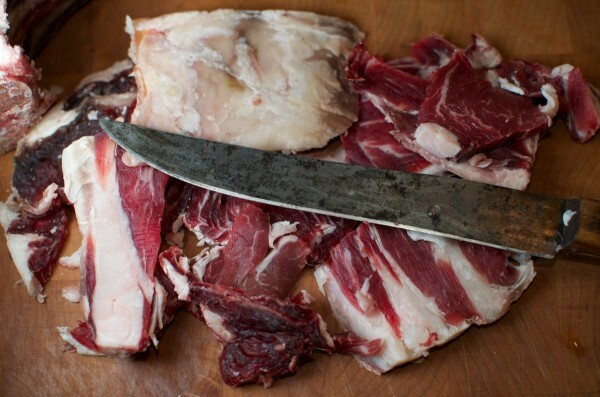 Natural enzymes in the meat, among them calpains and cathepsins, break down connective tissue and proteins over time. Not only does that make the meat more tender, but many of the breakdown products have flavors we would call “savory”, “meaty”, and “nutty”. 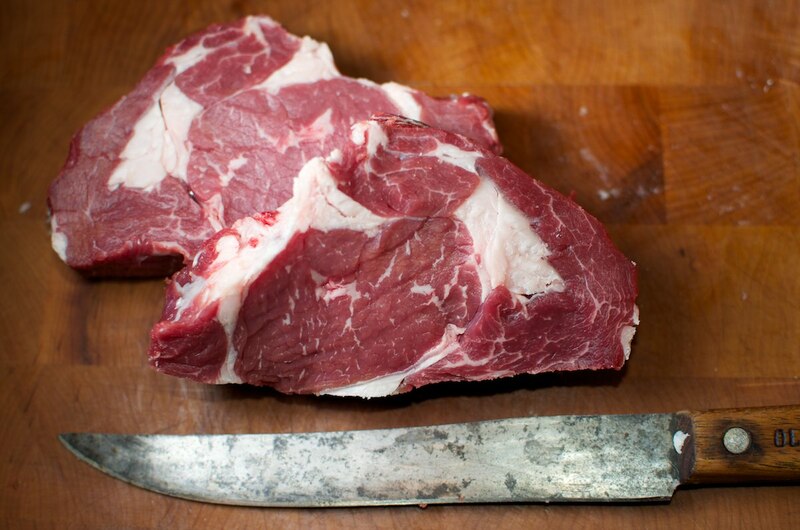 Dry aging beef also concentrates flavors, and helps forms a better crust. Most people like those concentrated flavors, but some find it too much. It takes a lot of time and fridge space. You get “shrinkage” as water evaporates from your meat. You also end up having to trim away a substantial portion of meat when you are finished. You pretty much have to trim and discard the whole exterior surface of the meat, which is why you can’t dry age individual steaks. OH GOD, WHAT IS THAT? This was written by cedar. Posted on Sunday, February 6, 2011, at 11:31 am. Filed under Techniques. Tagged beef, danger!, ingredients, meat, science!. Bookmark the permalink. Follow comments here with the RSS feed. Post a comment or leave a trackback. 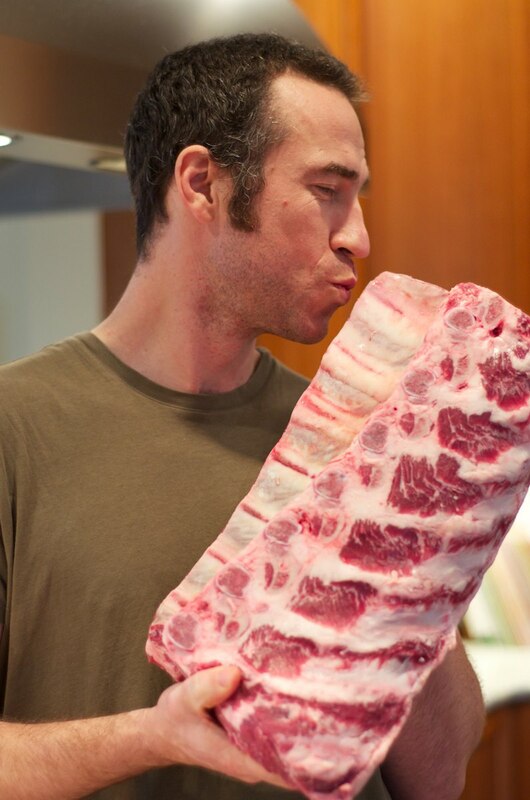 Cedar, I used to cater a bit and always asked my butcher for “30 day hang” rib steaks, cut at 2″ thick. I have never tried to do my own aging. 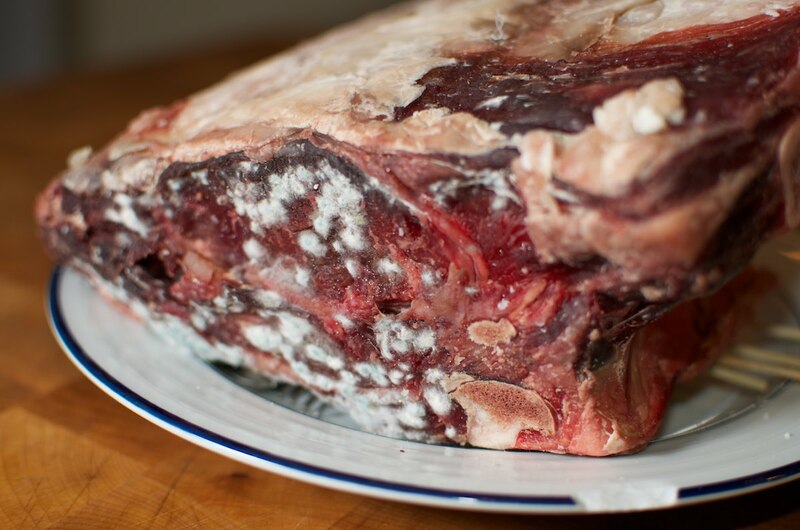 I will be trying this as there is nothing like a well aged steak…and yes, just trim the mold off, what lies beneath is the perfect steak. Thanks for this post! I aged it in a camping electric fridge, after 2 weeks it developed a puss like layer around it. I thought it had gone off, so i trimmed all the outside off and it seems ok underneath. It only realy dried at the bottom which was closest to the salt base. Does a wine fridge.. the temperature of a wine fridge is slightly high at more than 41degrees..